Desert Foraging — BEEHIVE FLORAL CO. I still remember the moment, seated there, surrounded by tourists recognizing the silence of the place. Deafening. Sacred. These days as Moab becomes ever popular and the tourists flow in, it seems more difficult to find quiet there. So as my husband Ev (Big American Story) and I passed through the overpopulated hub by nearly forty minutes I felt somewhat satisfied to know we’d be entering a place still connected to that incredible landscape but holding the original solitude enjoyed by the likes of Butch Cassidy and likely many of my own wild eyed ancestors. Soon enough we came to the marker for 3 Step Hideaway, tied to an old scraggly tree like some Spaghetti Western relic, waving in the wind. 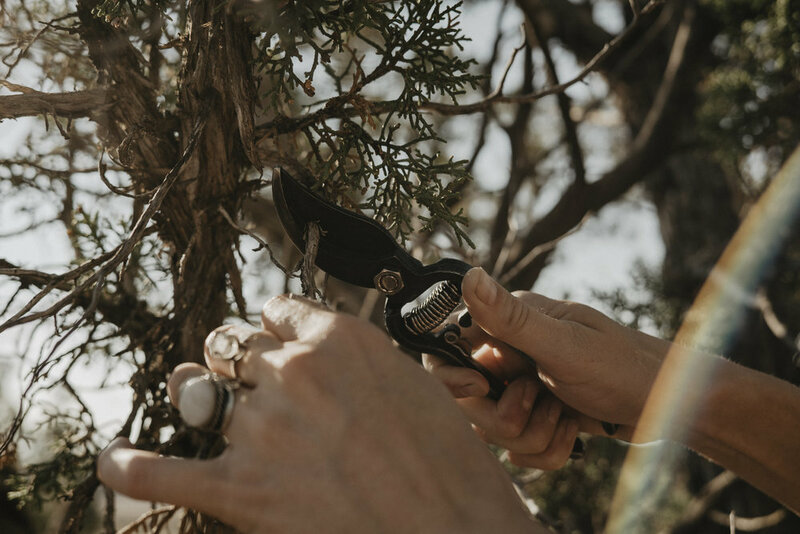 We were on the hunt for Juniper trees for an upcoming installation at Gather by Barebones, a Salt Lake City outdoor outfitters company that I work with extensively due to their socially conscious platform and genuinely good nature. I needed not just any old Juniper, but the kind twisted and baked by years of wind, heat and sun into the blackened sculptural fossils, almost unrecognizable as trees when you take them out of their original landscape. The kind foraged for moonshine back in the days of prohibition. And, according to Scott and Julie Stevenson, owners of 3 Step Hideaway, we’d come to the right place. The place feels like a movie set. Complete with Cantina and dinner bell as well as an authentic reproduction of a Teepee. The cabins are beautiful and immaculately kept, including composting toilets and wood stoves for next level camping comfort. And if that weren’t enough of a commitment, the entire place is solar powered. Three weathered cabins and a root cellar comprise the only visible remains of the original homestead established back in the late 1890’s. 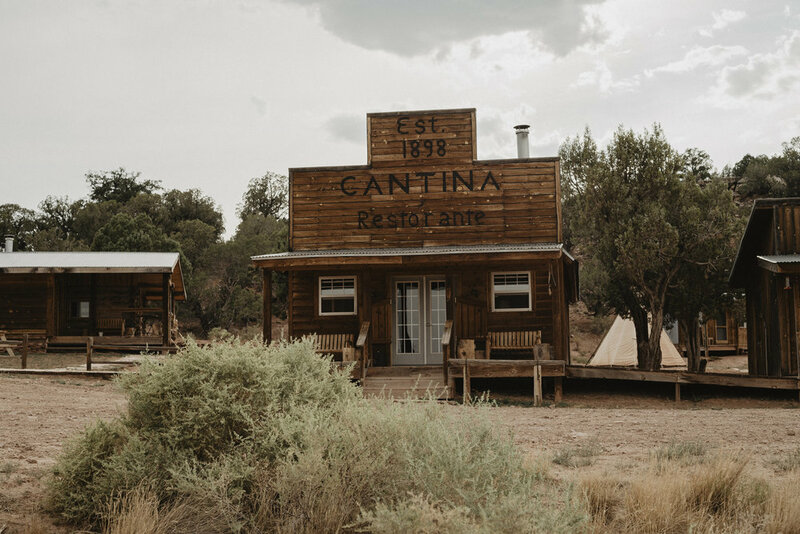 The old homestead was refurbished and additional buildings added in 2002, making for a comfortable and updated stay, accented by relics left by the ghosts of settlers past. 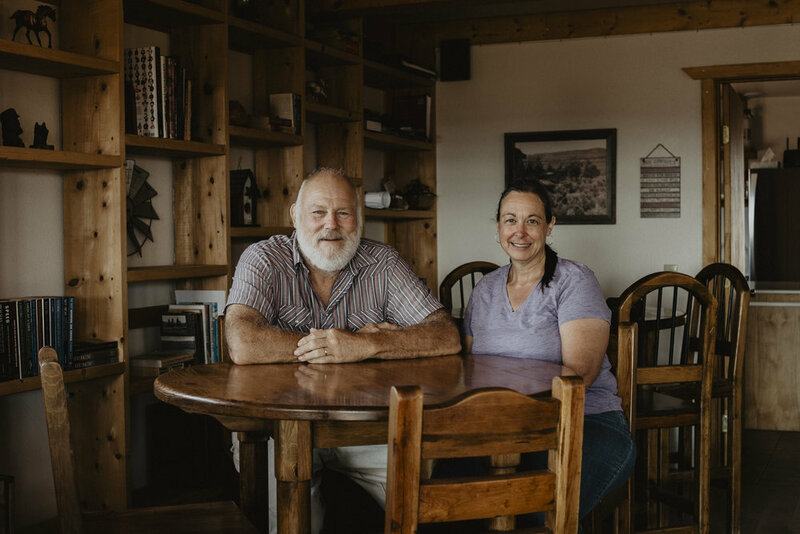 Julie and Scott are welcoming and kind and you’ll likely be greeted by their two sweet adventuring dogs and roving cat. You will enjoy a home cooked dinner and breakfast with plenty of local beer to be had too (if you like that sort of thing). For a reasonable fee, Scott allowed us to help ourselves to endless piles of fallen Juniper on his property. I could not get over the beauty of the twisted branches and filled the borrowed four wheeler to the brim with smoky desert branches. And of course I couldn’t help but sneak a few clips of sage as well as a handful of Juniper berries and bits of fresh Juniper to add to my collection back at the studio. Pictures here my favorite clippers by Barebones Living. The moon was exceptional that night. The “freakishly long” lunar eclipse of July 27 hung proud and mystical in the sky and we watched it in silence for some time from our cabin stoop. It was easy to fall in love and difficult to leave the place after such a short stay and we sincerely promised Scott & Julie a return. You can take a look at the sweeping installation of Juniper built at Gather by Barebones located in Salt Lake City at 1215 Wilmington Ave #140. In the meantime, here is my (less than professional) iPhone capture of the work in progress.